Tired of going to the same old grab-and-go chain for a cup of joe, but don't know where else to go? Here's a look at some of the area's best coffeehouses — Starbucks not included. WASHINGTON — While the D.C. area may not be known for its coffee joints, it does have some notable coffeehouses worth visiting. Depending on what you’re looking for, these local coffeehouses have it all, from coziness and comfort to history and character. Sidamo Coffee and Tea is a coffeehouse with a cultural flair. “We come from the birthplace of Arabica and Ethiopian coffee,” says Kenfe Bellay, the owner of Sidamo Coffee and Tea, which opened in 2006. To Bellay, coffee is not only a drink. “It’s our tradition,” he says. Born and raised in Ethiopia, Bellay grew up with coffee and roasted beans every day. Coffee is involved in every aspect of Ethiopian society, he says. Villages take part in coffee ceremonies where families gather to discuss and resolve issues. Since Ethiopia is the only country known for coffee ceremonies, Bellay wants to keep the tradition alive. At 2 p.m. every Sunday, Sidamo visitors can experience the coffee ceremony and see how the coffee is roasted, grinded and boiled. Sidamo offers single-origin coffees and over 24 kinds of loose teas. It is located at 417 H St., NE Washington, D.C. 20002. Its second location is in Fulton, Maryland. Ebenezers is a casual coffeehouse with a socially conscious mission. “We’re here to serve the community and we love giving back,” says Andrew Jefferies, the assistant manager at Ebenezers Coffeehouse. The coffeehouse is owned and operated by the National Community Church and all the proceeds go toward its community outreach projects. Jefferies describes the atmosphere as lively and positive. On Thursdays, Fridays and Saturdays, the coffeehouse hosts live music and other public events. Ebenezers serves fair trade coffee from Pennsylvania-based roaster One Village Coffee. The most popular items, according to Jefferies, are the Honey Lavender Latte, Caramel Whip and Salted Caramel Custard Latte. Ebenezers is located at 201 F St. NE Washington, D.C. 20002. Since there is no Wi-Fi, the industrial-chic environment of La Colombe encourages undistracted friendly chats and an overall relaxing time. “It’s laid back,” says Mark Sundermeyer, a barista at La Colombe. Sundermeyer says most people come to enjoy the coffee and hang out. The coffeehouse, which has been open for two years now, is known for its cold brew coffee, Sundermeyer says. In addition to the cold brew coffee, La Colombe offers single-origin coffees, draft lattes and pastries. La Colombe is located in Blagden Alley. “It’s probably the coolest part about it,” Sundermeyer says, since new restaurants and bars are opening up nearby. The coffee shop opened up its second D.C. location, in November, in Chinatown. You can visit La Colombe at 924 Blagden Alley NW, Washington, D.C. 20001 or at 900 6th St. NW. The Coffee Bar is a cozy, quaint specialty coffee shop in D.C.
“We see a lot of first dates here. It’s kind of cute,” says Dane Suarez, a manager at The Coffee Bar. The communal area is a good place to sit and “just chill out,” Suarez says. For those flying solo, the relaxed atmosphere is ideal for a quiet study session or to get some work done. The Coffee Bar focuses on single origin coffees and sources its beans from multiple roasters — from California and Colorado to Maryland. “We like to bring the best coffees to D.C.,” Suarez says. The Dirty Chai and Cardamom Latte are the most popular items in the winter, Suarez says. If you’re hungry, TCB serves food from local suppliers: Hawthorne Fine Breakfast Pastry, The Sweet Lobby, Bethesda Bagels and Paisely Fig. The Coffee Bar is located in the Historic U Street and Logan Circle area at 1201 S St. NW, Washington, D.C. 20009. Its second location is in the Golden Triangle District at 1200 17th St. NW, Suite 150, which is more of a grab-and-go coffee shop. Both a bike shop and a coffee shop, Gravel & Grind is the first of its kind in the D.C. area. “The best part of being a small-business owner is you get to indulge in your own passions,” says co-owner of Gravel & Grind Tracy Hathaway, who shares her love of bicycles and espresso with co-owner James Johnson. Gravel & Grind builds bikes from scratch, refurbishes old ones and sells Rivendell gear. The hybrid shop specializes in bicycles for everything from touring, camping, town riding, to commuting and old school mountain biking. As for the coffee, Gravel & Grind sources beans from ChocoSombra, a direct trade coffee roaster in Frederick, Maryland. “It’s a really balanced and low-acid coffee,” Hathaway says. The Peruvian coffee beans are used in espresso, pour overs and the iced coffee. The coffeehouse also offers single origin coffees from ReAnimator in Philadelphia, Pennsylvania, Ceremony in Annapolis, Maryland and Blanchard’s in Richmond, Virginia. Apart from the coffee, Gravel & Grind serves food from baked goods and sandwiches to Oversized Belgian Waffles (Saturday and Sunday only). Gravel & Grind is located at 124 S. Carroll St. in historic downtown Frederick, Maryland. Kaldi’s Coffee Bar is more than a coffee shop, Emily Wertz says. Wertz, a barista at Kaldi’s Coffee Bar, says the sense of community felt at the coffeehouse makes it unique from other coffee shops. Its open, modern layout encourages a social atmosphere. “It’s a cool place,” Wertz says. Kaldi’s offers pastries freshly baked in-house. Coffee-wise, most people order a Caramel Macchiato or Espresso Macchiato, Wertz says. You can find Kaldi’s Coffee Bar at 918 Silver Spring Ave. in Silver Spring, Maryland 20910. Vigilante Coffee Company is both a roastery and cafe that specializes in direct trade coffee. The space looks and feels like a garage because it used to be an old Model T Ford showroom. Music is also a hit at Vigilante Coffee. Every second Saturday of the month, Vigilante Coffee hosts a live music showcase. Vigilante Coffee is located at 4327 Gallatin St., Hyattsville, Maryland 20781. Killer E.S.P. is a hip and artsy coffeehouse in Old Town Alexandria. Simko describes the coffeehouse as eclectic. “We like to do a lot of art in here,” he says. Some of the artwork plastered on the walls and in other places of the shop is for sale. Killer E.S.P. uses Stumptown Coffee beans from Portland, Oregon. It also offers sorbet made in-house, and pies from Dangerously Delicious Pies in D.C. The pies and the Nutella Latte are the most popular items, according to Simko. Killer E.S.P. is located at 1012 King St. in Alexandria, Virginia. Clifton Café is a quaint coffeehouse and creperie in the small town of Clifton, Virginia. The town, which has a population of 200, was declared a National Historic District by the U.S. Department of Interior in 1985, and some of the historic homes date back to 1871. The cafe itself is located in a century-old home called the Weaver House, which was originally built in 1898 for the Weaver family who owned the general store next door. “You come to town and you get the whole experience,” says Dorian Pyzdrowski, a manager at the Clifton Café. The café’s menu includes items named after townspeople. One creation: the Bittner’s Bliss, is a crepe made with goat cheese, spinach, artichokes and grilled chicken, and is named after a resident who lives close to the cafe, Pyzdrowski says. The cafe serves breakfast all day and offers PT’s fair trade coffee, alcohol, dessert and lunch crepes. The most popular food item, according to Pyzdrowski, is Silva’s Savory, a crepe with grilled chicken, cheddar, guacamole and mango salsa. Another customer favorite is the Spicy Chicken Guacamole crepe. As for drinks, the Hazelnut Turtle Mocha tops the list. And if you’re into latte art, you’re in luck. Pyzdrowski says they add a design to all espresso creations. Clifton Café is located at 7144 Main St., Clifton, Virginia 20124. Whether you need a place to meet for business or want a place to relax, Bean Bar’s European environment is all-encompassing. Customers can sit in a private booth, at a community table, on a couch or on a comfy chair at the bar. The coffeehouse’s design includes rustic and industrial elements from the tables to the wine barrels. The artwork on the wall is hand-picked from a pool of local artists and photographers, and is rotated throughout the year. Bean bar specializes in single origin coffees and sources beans from Madcap Coffee. “Everyone really likes our lattes because of the latte art and the flavor,” Pinedo says. The caramel lattes and vanilla lattes are the most popular, he says. Although coffee is the focal point, Bean Bar also offers international teas and Virginia wines and beers. You can visit Bean Bar at 1601 Village Market Blvd SE, Suite 122 Leesburg, Virginia 20175. 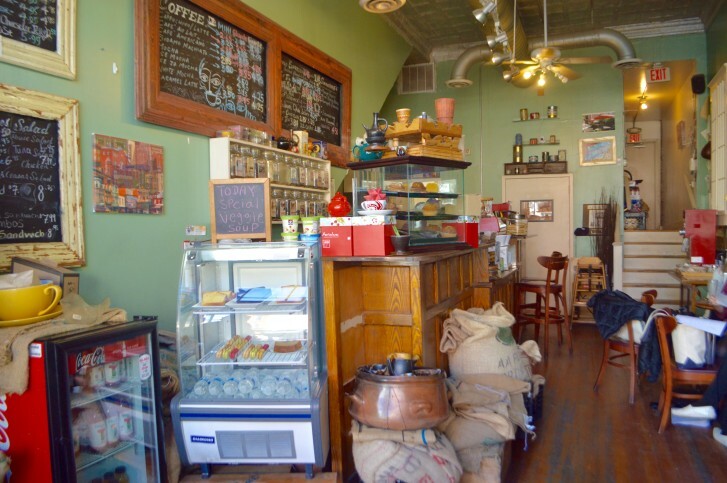 Similar to Clifton Café, King Street Coffee is in the heart of a historic town: Leesburg. The coffee shop is in an old house from the early 1900s. “It’s the hub of the town,” says Benjamin Knighton, who has been working as a barista at King Street Coffee for almost two years. King Street Coffee offers LOAN OAK coffee roast from Winchester, Va. and baked goods from local bakers in nearby Lucketts. The most popular items customers order are the scones, gluten-free muffins, lattes and regular coffee. You can visit King Street Coffee at 110 S King St., Leesburg, Virginia 20175.